The Group was set up in 2007 with just 3 Members and now 10 years later we have over 30 active members. 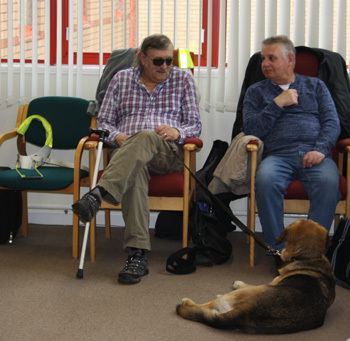 The Group is run by our visually impaired members and their Carers to insure we get the services and information that our Group needs. Being run by the members ensures we accommodate the activities we want to take part in, the resources we may need, all provided in a discreet manor. You may have lost some or all of your sight; but we believe that need not stop you from getting out and about enjoying yourself with others. We sometimes go on what could be called expeditions on public transport, but more about this later. So if you are a VIP - a Visually Impaired Person - we would love to hear from you! By joining any one of the listed Groups you will meet people with similar problems, from who you can learn where to go to get the results you may be looking for, along with the opportunity to make new friends. 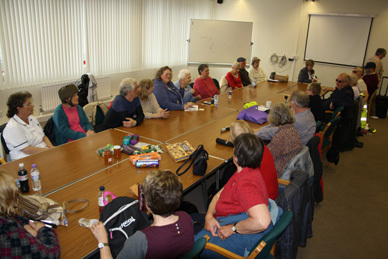 The West Telford VIP Group meets on the first Thursday in the month, 12.30pm at Meeting Point House, Telford Town Centre. As a Group we try to get speakers on a variety of subjects as wide ranging as possible, as well as getting out & about as much as we can. The Program for 2017 is coming together, so keep an eye on our Web Site for details, or better still come along to one of our meetings. Friday 27th January. Winters Day Out organised by sight loss Shropshire at Shrewsbury football club. Transport times: 10:15 Telford bus station, 10:30 Wellington bus station. Thursday 2nd, 12:30 pm, VIP Monthly Meeting, Meeting Point House, Telford Town Centre. This will be the Opportunity for Members to state there wishes for Trips via Train or Coach to various places of interest, type of speaker desired, i.e. Speaker who had or has an Interesting Occupation, or Hobby alternatively, Speaker with Information that could be of use to Members in their daily life, we will also discuss the Program for the Planned trip to the Mary Rose, details of this has already been posted to you. Thursday 2nd, 12:30 pm VIP Monthly Meeting, Meeting Point House, Telford Town Centre. Speaker from Health Watch stating their role within the health service including Hospitals, Doctors Surgery, Opticians, Homes for the elderly etc. Come along and learn more. Thursday 30th March to Saturday 1st April. trip to Portsmouth to see Mary Rose. travel by train for this 3 day event. Details of alternatives to whole day on Dockyard discussed. Thursday 6th April, AGM we will then follow up with a quiz prepared by Pat, that has been enjoyed so much by members in the past. Thursday 4th May, 12:30 pm VIP Monthly Meeting, Meeting Point House, Telford Town Centre. Speaker Alison Braid will give a talk on Robert Burns & his poems. Thursday 8th June, 12:30 pm VIP Monthly Meeting, Meeting Point House, Telford Town Centre. This month we will hold a quiz. Thursday 3rd August, 12:30 pm VIP Monthly Meeting, Meeting Point House, Telford Town Centre. This month we will hold a quiz. Thursday 6th September, 12:30 pm VIP Monthly Meeting, Meeting Point House, Telford Town Centre. Speaker Laura Cross will be talking about the services Guide Dogs offer. Thursday 5th October, 12:30 pm VIP Monthly Meeting, Meeting Point House, Telford Town Centre. Thursday 2nd November, 12:30 pm VIP Monthly Meeting, Meeting Point House, Telford Town Centre. The West Telford VIP Group serves Wellington, Hadley, Trench, High Ercall, Cold Hatton, Dawley, Madeley, Ironbridge, Telford Town Centre, Priorslee and all communities in between. To find out more call either Ken on Telford 250110, Hayley on 501437 or Jenny on 433276 . If there is no reply please leave your name and a contact phone number on the answer service.